Grease a 9×9 inch square pan with butter. In a small bowl separate the two egg whites. In a large bowl combine the pumpkin, brown sugar, 1 egg and egg whites, and oil. Add to the bowl the flour, baking powder, cocoa powder, cinnamon, allspice, nutmeg and salt. Stir until everything is combined and there are no lumps of flour. Add to the bowl the chocolate chips and stir until just evenly incorporated. Carefully pour the batter into the baking pan, making sure its spread evenly. Bake for 15-20 minutes or until a toothpick inserted in the center comes out clean. With my oven I usually need to bake for the full 20 minutes. Allow the brownies to cool, serve and enjoy! Fall has arrived. The air is cool and crisp, the leaves are turning, and I’m under a quilt as I type this on the couch. One of the best parts of fall is the squashes that comes into season. 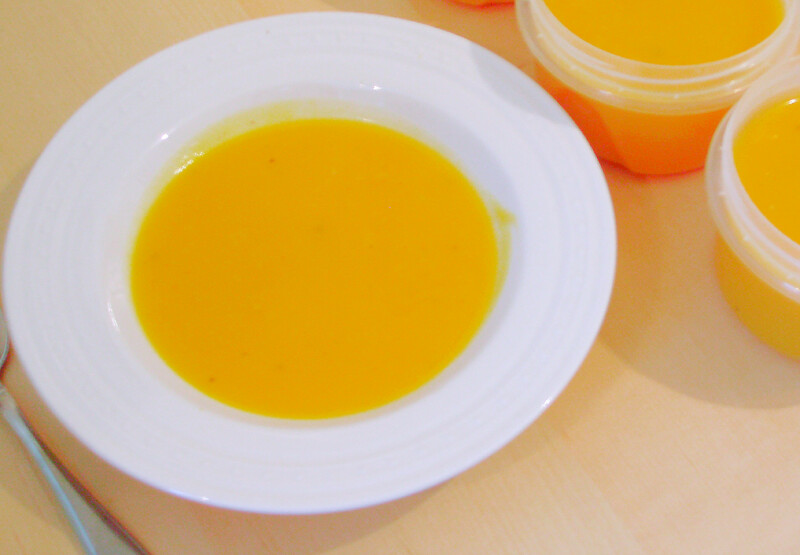 One of the most popular is butternut squash. I figure its popularity stems from the fact that it is very user friendly, and you can buy it pre-chopped at the grocery store. Sometimes convenience is everything. If working with a whole butternut squash, peel and remove any seeds. Then cut the squash into 1 inch chunks. If working with pre-cut squash be sure the chunks are all about 1 inch in size, and cut down any chunks that are too large. Peel the onion and chop into a coarse/thick dice. Add onions and salt to the pot, and cook until the onions are softened, about 5 minutes. Add butternut squash to the pot, chicken stock, and enough water to cover the contents of the pot and raise the heat to high. Bring the pot to a boil, and then lower the heat to medium. Simmer the squash until tender, about 20 minutes. In batches puree broth and vegetables in a blender until smooth. Transfer pureed soup into a clean pot. Season the soup with additional salt (if desired), pepper and lemon juice. Once soup is seasoned to preference, serve and enjoy!